Cleaning up old CSS is not seen as important as adding new features. We are never 100% confident that the CSS left behind is not in use. We add extra CSS to allow for more design options, but those options are never used. 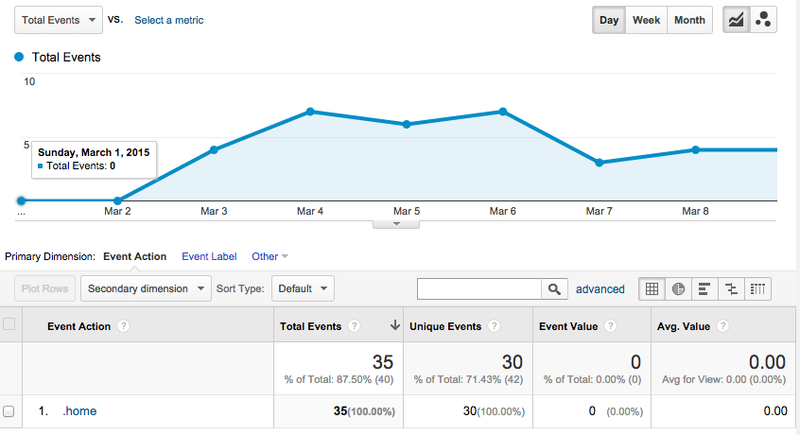 So I’m proposing another weapon in our arsenal: Google Analytics. How can GA track CSS use? To track CSS usage with this you can use this URL with ‘background-image’, this will register an event each time the CSS selector is triggered. For example the following CSS would register an event for every page request (as an HTML tag is present on every page). The user is set to ‘css’, the category is ‘cssaudit’ and the action is the same as the selector you want information about. With this technique you can identify CSS selectors that you want to know their usage level, add the tracking image, then wait a few days to receive a number reflecting it’s use. The following CSS was included in david-lewis.com on March 2nd. This CSS selector is only triggered on the homepage. The following image is from Google Analytics and shows a report of the selector usage. All browsers that hit your site will be included in the tracking. Developer effort level is very low, once the selector to track is chosen.